I remember when I was a little girl my grandmother and auntie used to spoil me with the most elaborate and embellished dresses you could have ever imagined. Teamed with the prettiest pair of floral shoes. Not the most practical for a five year old but I loved them. The floral patterns, the jewels and vibrant colour's made them feel extra special. I felt like a princess. Little did I know that this very moment was the very beginning of my love for fashion. It was the first time that I realized that what I wore changed the way I felt inside. My passion for fashion is still growing more and more to this day and that is just one of the reasons why I am delighted to be teaming up with Farfetch and Dolce and Gabbana for this collaboration. Farfetch is an online luxury store housing 400 designer boutiques all under one address offering an inspirational shopping experience to the worlds most fashion forward consumers. Dolce and Gabbana is just one of the designers that I am styling today. It is a luxurious Italian brand which is constantly evolving but always staying true to its roots, expressing new forms of elegance presenting itself as a modern classic based on superior content and creativity. The Dolce and Gabbana woman is strong, confident and elegant. She is passionate about true style and knows how what she wear's, should make here feel. The spring/summer collection is really beautiful at the moment and has really inspired me to add more floral's into my capsule wardrobe. It is very fun and colourful, mixing prints and textures creating the perfect summer look to celebrate the warmer temperatures. The look I styled today will take you to a garden party, a barbecue, or even lunch on a yacht in Cannes. 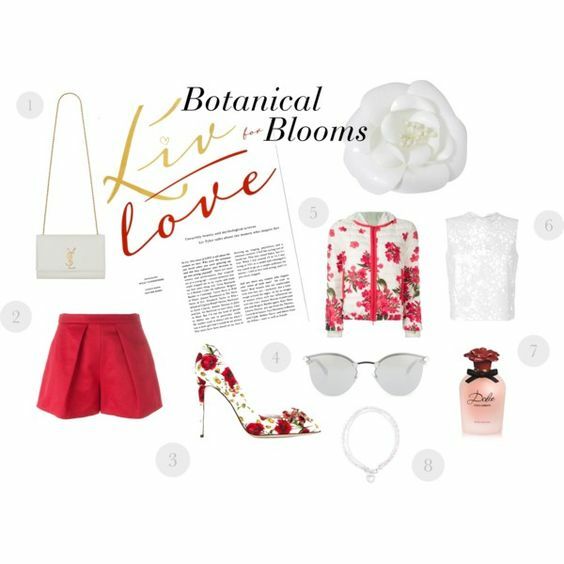 The key item in this look is the Dolce and Gabban floral pump. This floral pump always gets all the attention where ever it goes and can be styled with a number of different looks. Taking inspiration from the catwalk I broke up the prints to show my own personal style but still staying true to the Dolce and Gabbana trend incorporating different fabrics and textures, while also including the mix of floral's. A little white bag is a wardrobe staple for me throughout the summer. It will go with all of your outfits and can be worn day or night to any event you may have. I love tailored shorts that really show off your waist and compliment your curves and I believe that these are the perfect pair of shorts to do just that. A pair of floral pumps are something that I believe every girl should have in here wardrobe. Especially these from Dolce and Gabbana as they are the ultimate show stoppers that can be worn with a very simple outfit or taking inspiration from the catwalk and pairing them with mixed or matching patterns. However you decide to where them they will be adored by all. When styling this look I wanted to keep the accessories quite simple to let the floral's do the talking. I thought these sunglasses from Fendi were elegant and the perfect way to finish of this outfit. I was inspired by the bomber jacket to include this Moncler floral print jacket in this look. I think it will look very high fashion draped over your shoulders with a simple white top or worn as usually if your so wish. White lace is one of my favourite pieces to wear. I love how classic and expensive it looks. Dolce Rosa Excelsa is one of my favouite perfumes and the packaging is so beautiful I couldn't leave it out of this floral inspired look. I love how dainty this bracelet is. Daintly style jewelry is very popular at the moment and I thought it was perfect with this look. All of the mentioned pieces in this post are shopable via Farfetch and at the moment they are offering up to 50% off - you're welcome!